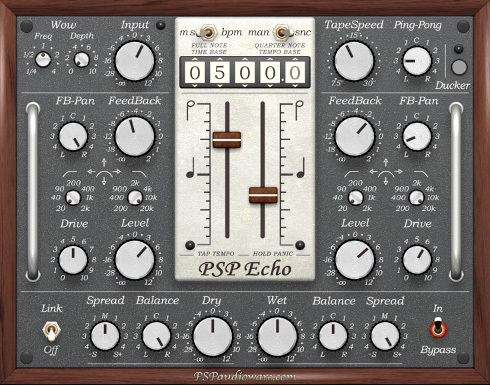 PSP Echo is a high quality echo processor. PSP Echo’s powerful and unusual features combined with its smooth operation makes it ideal for all kinds of creative uses from simple slap back and sustain effects through ping-pong delays and spacious echoes. Use the delay sliders to add special tape echo effects for even more unique effects. The tape wow control and built in ducker further extend the creative potential of PSP Echo. Internally, the Echo is like a combination of four mono tape delays—two for the initial ping-pong pre-delay and two for the main stereo echo. PSP Echo includes a set of extremely useful factory presets that cover a wide range of this plug-in’s settings.